This article was co-written with Ali Mnif, Country Manager, Silatech in Tunisia. Tunisia is perhaps best known for its successful transition to democracy in the wake of the 2011 Arab Spring, but despite the political transition and compromises that landed the Tunisian National Dialogue Quartet the Nobel Peace Prize in 2015, the economy has faced significant challenges over the past years. Prime Minister Youssef Chahed, in power since 2016, has forged ahead with significant reforms intended to strengthen the Tunisian economy and secure hundreds of millions of dollars in IMF loans. As part of these changes, local entrepreneurs had lobbied for changes in the laws that had stifled their competitiveness, including currency controls, customs fees, an unclear legal framework, and lack of financial support from governmental institutions. The team also proposed initiatives to promote risk-taking and innovation among young Tunisians. In April 2018, Tunisia made history in the Arab world when the Tunisian parliament voted to adopt the Tunisia Startup Act after a lot of hard work by the country’s leading entrepreneurs. It took the team of entrepreneurs more than two years to put together the detailed proposed changes, after painstakingly reviewing each law that was harming startups’ ability to succeed, resulting in the 20-measure law approved by the government this April. Ultimately, the legal framework created by the Startup Act will support the creation, development, and internationalization of Tunisian startups. Critical to their success was the support of key ministers. In February 2016, the then Minister of ICT, Noomane Fehri, decided to gather more than a hundred ecosystem players- entrepreneurs, investors, academics, public servants- to discuss legal change to incentivize growth. At these meetings, participants suggested all the possible reforms and measures that would transform the ecosystem, and remove the majority of the red tape that prohibited further and faster development. Out of the different meetings, more than 100 various measures were put on the table at some point. A task force, comprised of 70+ leading actors in the sector, emerged, and they began putting together a feasible plan. Tunisia PM Youssef Chahed at an event. Image credit: @ YoCh_Official- Youseff Chahed on Twitter. This process was not without its challenges, however. In summer 2016, a government reshuffle impeded the necessary legislative process, pausing advancement of the movement. Bilel Bouraoui, a well-known serial entrepreneur in Tunis, prepared and circulated a petition in order to ensure continuity: the community refused to lose the progress that they had made through these conversations and proposed resolutions. 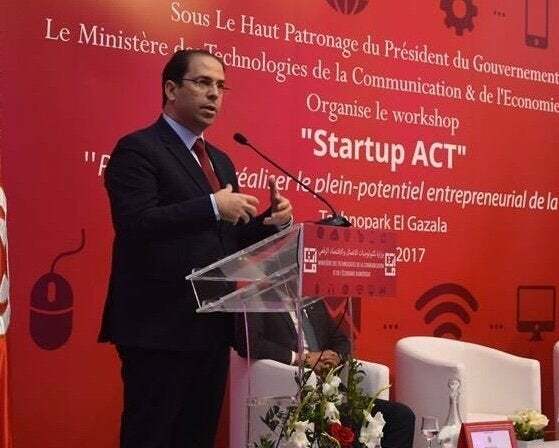 Critically, the freshly appointed minister of ICT, Anouar Maarouf, heard the call, and the Startup Act task force was back on track with a strong political support. The ecosystem consistently showed support and pressured as needed all the way through December 2017, when a ministerial council approved the Startup Act and deferred to the assembly for a vote. The rest, as we now know, is history. This is part of a broader movement across the region as the Fourth Industrial Revolution (4IR) changes the way we relate to each other, the work we do, the way our economies work, and what it means to be human. In the Arab world, there is increasing urgency towards capitalizing on these changes by embracing the innovation of startups and entrepreneurs. Last year, the World Economic Forum convened 100 of the Arab world’s top startups shaping the Fourth Industrial Revolution. At Davos this year, the Chairwoman of the Middle East North Africa Regional Business Council, H.E. Sheikha Bodour Al Qasimi, launched a whitepaper exploring how 4IR is shaping the future of the region. Most recently, the WEF has embarked on a new project, Digital Arab World, that aims to convene a Digital Innovation Dialogue Series with the goal of ultimately creating a playbook for governments interested in promoting digital innovation through supporting and collaborating with digital entrepreneurs, startups, and SMEs, with the input of all relevant stakeholders. With this being the case, Tunisia’s Startup Act is notable not just for the important steps forward the country is taking to build a thriving entrepreneurship ecosystem, but also because this is the first time in the Arab region that startups have successfully lobbied policymakers to change the laws that affect them. Hopefully, we will see similar success in other countries across the region.